Prevent your spy devices from falling into your enemy's hands. Creating devices that could perform a variety of functions until exposed to light, heat, liquid, or whichever destruction trigger its designed to react with, has been the goal of a relatively new field of study called “transient electronics.” For years, researchers have been developing such devices. But not one could demonstrate the power, stability and shelf life for practical use—until now. A group of scientists from Iowa State University, have developed a self-destructing, lithium-ion battery capable of delivering 2.5 volts and dissolving or dissipating in 30 minutes when dropped in water. 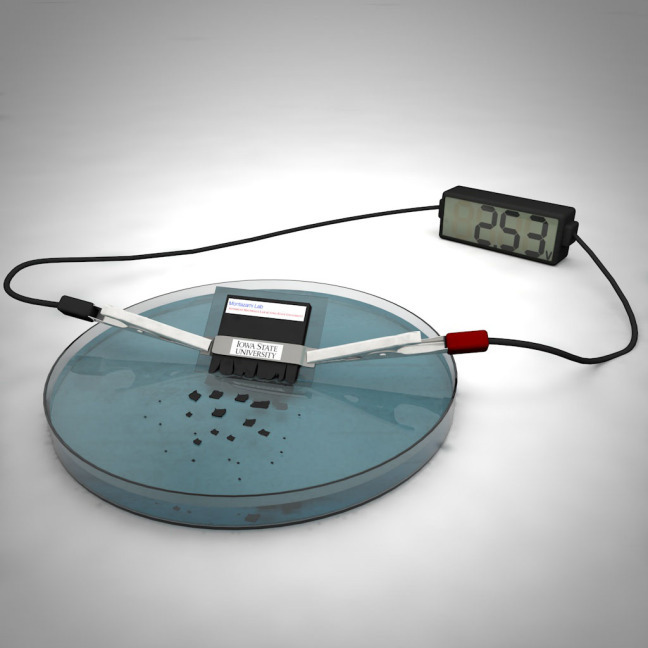 Encased in a degradable polymer composite that swells and eventually breaks apart in water, the battery is claimed to have the ability to power a desktop calculator for about 15 minutes. While there’s still a long way to go, the device’s future applications in several fields are very promising. Once finished, it could keep military secrets out of enemy hands, undercover spies incognito, save patients the pain of removing a medical device, or even allow environmental sensors to wash away in the rain.